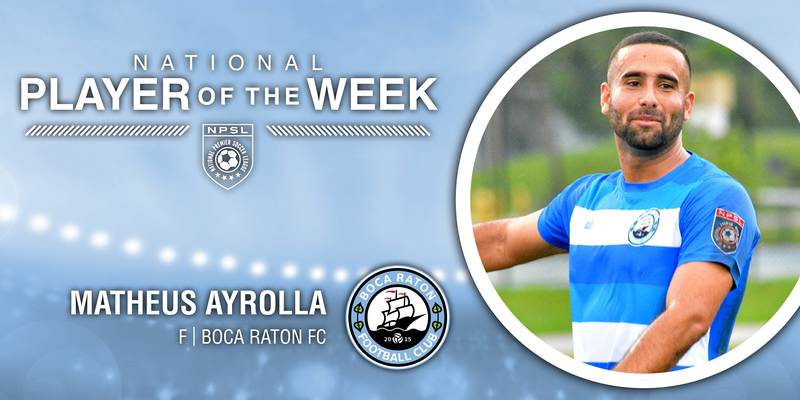 Boca Raton FC forward Matheus Ayrolla has been selected as the 11th NPSL National Player of the Week for the 2018 NPSL season. Ayrolla scored four goals in a 4-0 win over Storm FC and now leads the Sunshine Conference in goals. Ayrolla was born and raised in Fort Lauderdale. In college, he played for Lynn University while receiving an Associate Degree in Mass Communication. Ayrolla then signed with the Fort Lauderdale Strikers U23 NPSL team in 2016 before going to Brazil to play professionally for Friburguense. 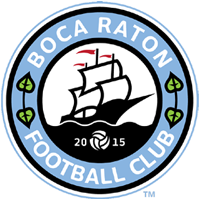 Ayrolla returned to the United States in 2018 to play with Boca Raton FC. The winner of this national honor is determined by a vote of media members from across the country. It is awarded every week during the regular season. The National Premier Soccer League (NPSL) is the largest established men’s soccer league in the United States with 98 teams competing across the country in 2018. The NPSL is a successor to the Men’s Premier Soccer League (MPSL), which was formed in 2002. The NPSL is a member league of the United States Adult Soccer Association (USASA) and sanctioned by U.S. Soccer, the governing body of soccer in all its forms in the United States. The NPSL’s cooperative and turnkey ownership platform has led to its explosive growth, countless player development opportunities, and commitment to grow the game in the United States. For more information about the NPSL, please visit npsl.com.